All returns must have a RMA before we will issue a return. All items returned without an RMA won't receive a full credit and are subject to a 15% restocking fee. We use flat rate shipping for most of our items. Some items you will need to contact us for a shipping quote, by doing this we can make sure you receive the best shipping rate possible. We use a variety of services for shipping such as:USPS, Spee Dee Delivery, Fedex, and UPS. Since we ship with USPS we can and do ship to PO boxes. We warranrty all of our MWM products one year frm the date of purchase. All other parts carry the manufacturers warranty. In the event of any legal proceedings arising out of the sale of this item or any other transaction with Seller, any action or actions brought against Seller must be brought in the state of Iowa; if in federal court then in the federal district court covering Decatur County Iowa, if in state court then in a state court in Decatur County, Iowa. 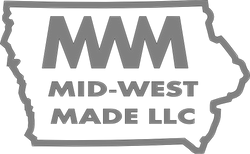 If this forum selection clause or any other term is too burdensome for you (Buyer) then please do not buy (Mid-West Made LLC) items. If any portion of this agreement is found to be illegal or unenforceable by a court of competent jurisdiction such portion shall be severed and the remainder of the agreement enforceable. By purchasing this item Buyer is acknowledging that this is a legally binding contract, and Buyer is further agreeing to all terms herein.